The lungs are among the busiest organs in our body. It is their duty to supply oxygen to the rest of the body and drive out carbon dioxide. The lungs function by expanding when inhaling and contracting when exhaling at a rate of 20 times per minute. Your lungs consist of two organs that look and work like a sponge. They are both filled with air and are located on opposite sides of the thorax or chest. The lungs are connected to the nose through the windpipe which is also known as the trachea. The air you inhale comes in through the trachea and enters the bronchi before entering the lungs. The bronchi are tubular branches that divide and further subdivide into a number of small and microscopic branches known as the bronchioles. 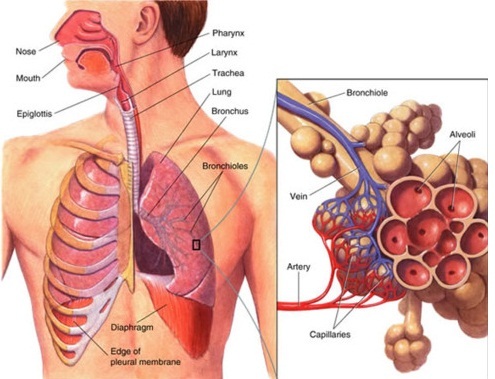 On the end of each of your bronchiole, there is a bunch of alveoli. The alveoli are small air sacs in which absorption of oxygen into blood takes place. Moreover, the expulsion of carbon dioxide also takes place in the alveoli. The carbon dioxide generated in your body as a result of metabolic reactions is expelled from the blood and absorbed by the alveoli, from where it is dispatched out of the body through exhalation. The alveoli are supported by a thin layer of cells, which is known as the interstitium that are present in between them. The thin layer of tissue, called as Pleura, covers your lungs. It is also the same tissue layer that forms the lining of the inside portion of your chest cavity. There is a thin film of fluid also present around your lungs, which works in the same manner as a lubricant and allows your lungs to contract and expand smoothly without contracting any damage from the surrounding ribs. The lungs perform the task of absorbing oxygen from the air that you inhale and expelling the carbon dioxide from your body with the air that you exhale. The functioning of lungs can thus be separated into two stages: inhalation and exhalation. When you breathe in or inhale air, the diaphragm and the muscles present in between the ribs contract, increasing the space in the chest cavity for the lungs to expand. The air you inhale through your nose or mouth travels through the trachea and enters your lungs via the bronchioles. The air is then passed on to your air-sacs known as alveoli. In these air sacs, the transfer of oxygen takes place from the air sacs to the blood vessels. This transfer is aided by a protein present in the red blood cells known as hemoglobin. At exactly the same time, the transfer of carbon dioxide also takes place from the blood vessels to the air sacs. The oxygen that has been absorbed in the blood vessels in your lungs is transported first to the heart through the pulmonary vein and then from there to the rest of your body. When you breathe out or exhale, the diaphragm and the surrounding muscles of the ribs relax, decreasing the space in the chest cavity and contracting the lungs. As your lungs contract, so do the alveoli, and the carbon dioxide present in them is forced out. The carbon dioxide then travels up through the bronchioles, the trachea and finally out of your body through the nose or mouth. Usually exhalation is a less stressful exercise than inhalation and does not require any kind of effort from the body since the muscles are relaxing. However, if you have a lung disease or are doing any kind of physical activity, your abdominal muscles will be contracting and putting even more pressure on the lungs, and then the lungs are usually put under by the relaxing diaphragm and rib muscles. This will force out the air more rapidly through your lungs than usual. For instance, the nose has several hairs that filter the air entering the lungs. Any large particle that tries to enter into the lungs with the air will be caught in these hairs. The irritants that are small enough to pass through the nose cannot get past the sputum or phlegm which is a thin layer of mucus, lining the walls of the breathing tubes, through which the air is passed on to the lungs. The breathing tubes have small hair like fibers called cilia that perform the task of moving the mucus in an upward direction towards the throat. From the throat, the mucus is passed on to the epiglottis which takes the mucus in and let it be swallowed. This process of mucus swallowing goes on in your body which you may not even know. Coughing is another means through which your lung protects itself. Coughing can help the lungs in expelling the mucus that has been building up in a much more quicker manner than the cilia. Coughing is not a normal thing though and occurs when your bronchial tubes are irritated. Bronchospasm is the last method that is employed by your lungs to keep themselves protected from the irritants. It is a process in which the band of muscles that surround the airways of your lungs begin to tighten. This narrows the breathing tubes and keeps the irritants out. The tightening of these tubes is performed very rapidly, which is why it is given the name of bronchospasm. However, this method of irritant expulsion can prove to be extremely dangerous for you if you suffer from COPD or asthma since you won’t be able to breathe at all because of the narrowing of the airways.